So when you jump into this "blogging" adventure you find so many wonderful & talented papercrafters out there and Jen del Muro has not only incredible talent, but some fun sketches to play along with! Plus, HELLO, there is BOOMER SOONER blood in her family...couldn't be a BAD thing right? ?...lol Anyhoo, back to the card! 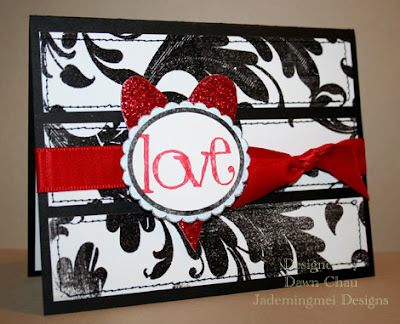 I've been on this black & red kick lately and had some great cut out hearts to use up. I started with SU! black card base and sewed on the on the patterned paper(Me & My Big Ideas), which is cut in three even pieces. I then tied on the red ribbon(AC Moore) and added the heart and focal image. The heart was more of a primitive red color and I needed it to match the bright red ribbon...so after searching my embellisment bins, the Christmas Red Stickles were staring right at me! PERFECT! I did put it on really thick so it did have to dry overnight. The focal image is SU! Label Frames oval stamp. The "love" is SU! whimsical alpha and I had to squeeze all the letters in by just guessing where it was going to land...should get a stamp-a-ma-jig eh?? I also added more bling around the frame with Diamond stickles...this card really SPARKLES, although its hard to grasp from the photo! Pretty card and great tip at the end. I love the little details you put in your work. The sewing makes a big difference. this card ROCKS!!! love it! thx for playing!